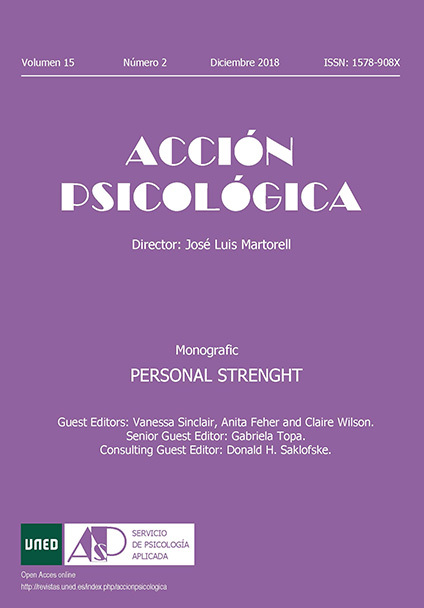 Acción Psicológica is a semiannual journal published by the Faculty of Psychology of the Universidad Nacional de Educación a Distancia (UNED) since 2002. Publishes original research, review, theoretical or methodological contributions, as well as case studies on different areas of Psychology and Life Sciences. Accion Psicologica has been indexed in Emerging Source Citation Index (ESCI) by Clarivate Analytics. Bibliographical (International): Emerging Source Citation Index (ESCI - Clarivate Analytics), Academic Search Complete, Academic Search Premier and Fuente Academica Plus (EBSCO), ProQuest Psychology Journals, ProQuest Central, ProQuest Central K-12, ProQuest Health Research Premiun Collectium, ProQuest Hospital Premiun Collection, DOAJ, FirstSearch (OCLC), PubPsych (ZPID), SciELO, Open J-Gate, Dialnet, e-Revistas, Redalyc. Bibliographical (National): COMPLUDOC, ISOC (CSIC-CINDOC), PSICODOC, PSYKE. Assessment of quality of journals: CIRC, DICE, ERIH PLUS, IN-RECS, LATINDEX, MIAR, RESH. Identification of journals: ISSN, Ulrich´s. Library Catalogues: ARIADNA (BNE), REBIUN, CCPP (MECyD), WORLDCAT (USA). Impact Factor IN-RECS 2011 = 0.362 (Journal Rank 21. 2Q. Subject Category = Psychology). Acción Psicológica accomplishes the requirements of the Ph.D of UNED. The journal meets the 33 LATINDEX quality criteria. Journal Profile in Google Scholar. Call for Papers Special Issue "Personal Strengths"
Submission Deadline for full manuscripts: September 7, 2018. We are pleased to announce that Accion Psicologica has been accepted for indexing in Fuente Academica Plus (EBSCO). La revista Acción Psicológica ha sido indexada en el Emerging Source Citation Index (ESCI) de Thomson Reuters en 2015. [In 2015 the journal Accion Psicologica has been indexed in Emerging Source Citation Index (ESCI) by Thomson Reuters]. We are pleased to announce that Accion Psicologica has been accepted for indexing in the Emerging Sources Citation Index, a new edition of Web of Science™. Content in this index is under consideration by Thomson Reuters to be accepted in the Science Citation Index Expanded™, the Social Sciences Citation Index®, and the Arts & Humanities Citation Index®. The quality and depth of content that Web of Science offers to researchers, authors, publishers, and institutions sets it apart from other research databases. The inclusion of Accion Psicologica in the Emerging Sources Citation Index demonstrates our dedication to providing the most relevant and influential psychological content to our community. La revista Acción Psicológica ha sido indexada en Redalyc en junio del 2014. [In 2014 the journal Accion Psicologica has been indexed in Redalyc].